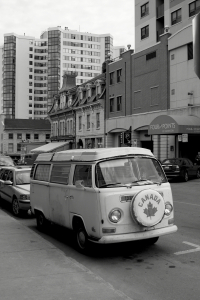 Patriotic people-mover: a pre-1972 Volkswagen Microbus resting in Kingston, Ontario. There are few vehicles are more soaked in stigma than the iconic Volkswagen Microbus, in all of its many forms. Nothing says hippie counterculture, free love, and daisies shoved down gun barrels like the Microbus, which defined an era thanks to its spacious interior and ability to serve as a rolling canvas for wannabe artists. While the lovable German people-mover was indeed the ride du jour of the Age of Aquarius, it should be remembered that the Microbus line both preceded and outlasted Jim Morrison’s career. 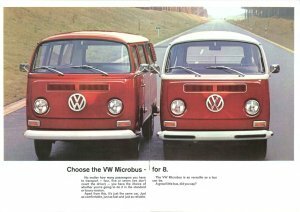 Born in Germany in 1950 to serve as the utility-minded stablemate of the equally iconic Beetle, the Microbus was designed to fill many niches. Called the ‘Type 2’, and known in Europe as the Transporter, the bulbous VW was produced in numerous body styles ranging from pickup to panel van to camper, not to mention the desirable ‘Deluxe Microbus’ (a model festooned with tourist-friendly skylights). A second-generation Microbus (right) reverts back to nature alongside a 1980s-vintage Vanagon in Ottawa, Ontario. A slow evolution followed the introduction of the Microbus. Though it departed the U.S. market in 1979, continued in production in Latin America until 2013. The first-generation Microbus ran from 1950 till 1967 and featured engines ranging from 1.1 to 1.5 litres, while the second-generation took the model from The Summer of Love until the end of the Carter Era (1979). A slightly modified Gen-2, still containing an air-cooled engine, lived on in Mexico and Brazil well into the 21st Century. Those second generation models are often remembered by North American non-owners as impassable barriers encountered while struggling up a steep mountain grade. 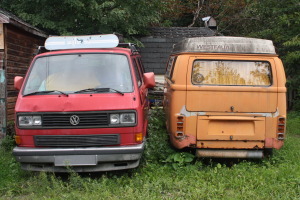 Ready for soccer practice or a Woodstock revival, these ’72 VWs had space to spare. Certainly, the Microbus was no rocket. The second-generation engines were gutsier than before, but those 1.6 to 2.0-litre power plants still topped out at 70 horsepower. Diesel Volvo wagons (the kind favoured by those with grey beards and elbow patches) could blow them into the weeds. 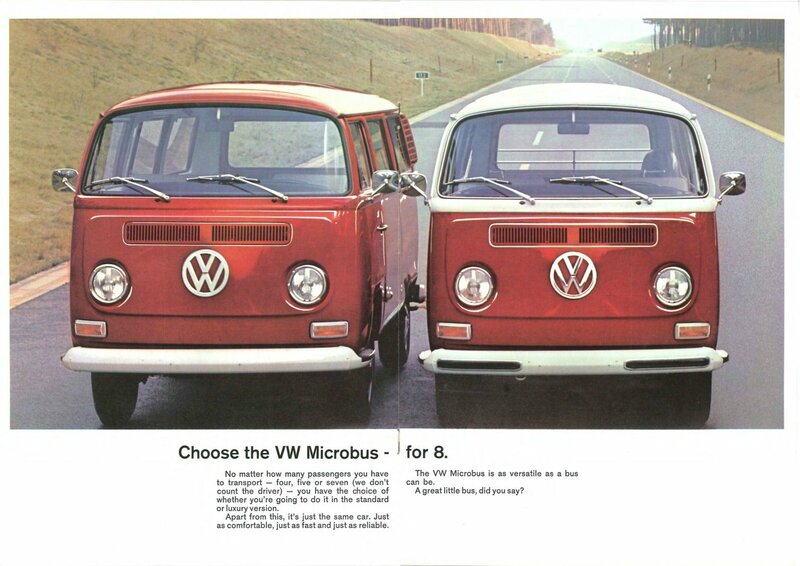 But speed wasn’t why owners and enthusiasts gravitated to the Microbus. A unique sense of character, combined with space and efficiency, was the vehicle’s true charm, and it continues to draw new fans. 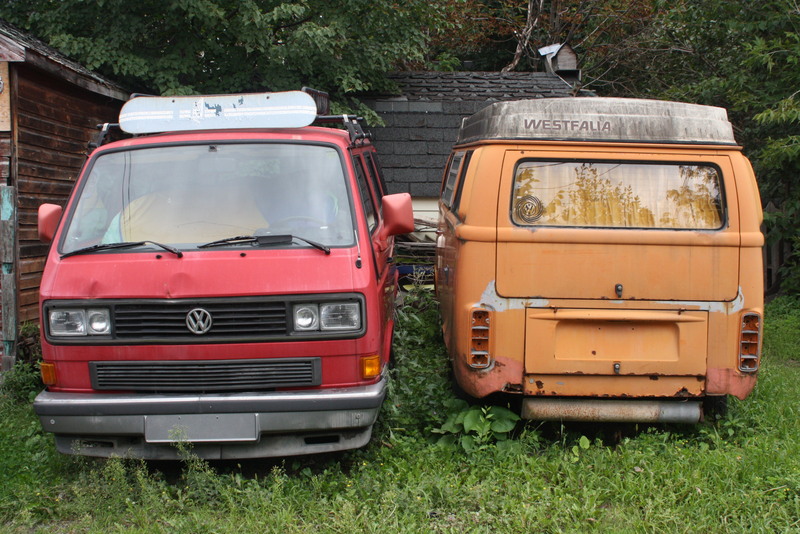 A quick Google search will reveal a world of potential friends to any Microbus owner. The longevity and continued adoration of the VW Microbus proves that a vehicle doesn’t have to be fast to be fun, and that practicality and familiarity counts for something in an industry obsessed with the Next Big Thing. This entry was posted in Spotted in the wild and tagged Microbus, Volkswagen, VW, VW Microbus on December 12, 2014 by Steph Willems.